From Thursday 10 January 2019 until Monday 10 January 2039: Enjoy 12 % off! From Thursday 10 January 2019 until Monday 10 January 2039: Enjoy 15 % off! From Thursday 24 November 2016 until Tuesday 31 December 2019: Enjoy 10 % off! First opening its doors at the start of 2015, Hotel Eurostars Central boasts experience, design, state-of-the-art technology and comfort to guarantee ultimate guest satisfaction. Hotel Eurostars Central offers 135 bright, modern, single, double or triple rooms, complete with wooden flooring, fully-equipped bathroom, Wi-Fi connection and city views. As well as a delicious breakfast buffet, the Eurostars Central café provides snacks, wines, cocktails and aperitifs. Eurostars Central is located in one of the districts in Madrid most renowned for its incredible gastronomical offerings, such as the new Barceló market, more than making up for the lack of on-site restaurant. The hotel also boasts three meeting rooms, a fitness centre and indoor parking. 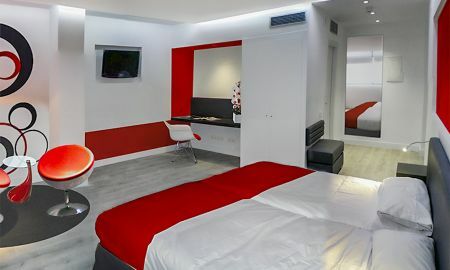 Located in one of the best districts in the heart of Madrid, Eurostars Central is within easy access of Paseo de la Castellana, Gran Via and Plaza de Cibeles. Tourist attractions such as Paseo de Recoletos, Retiro park, the National Library, Puerta de Alcalá, the Royal Academy of Fine Arts, Plaza de Espana and Serrano shopping centre are all just a 10-minute walk away. Hotel Eurostars Central benefits from the three nearby metro stations Alonso Martínez, Tribunal and Bilbao, and Madrid-Recoletos station is only 5 minutes away. Madrid-Barajas Airport is just 13 kilometres from Hotel Eurostars Central.